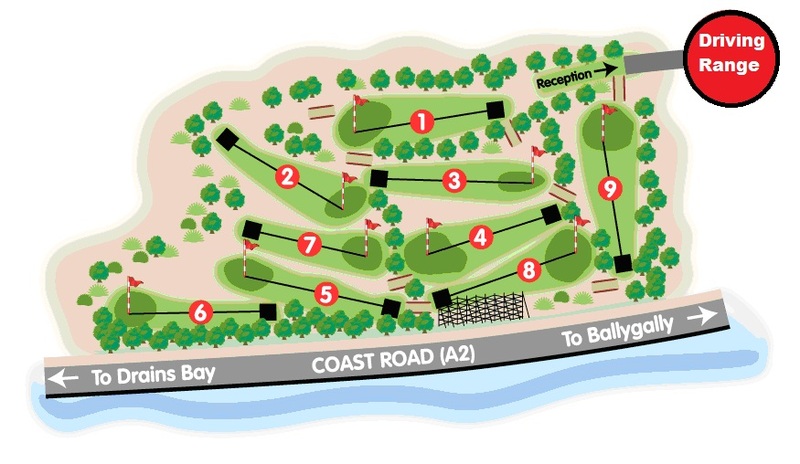 This Par 3, 9-hole parkland golf course offers magnificent views of the Antrim coast and across the sea to Scotland. All ages and standards of golfer are welcome from the beginner to the experienced golfer. As a public course no membership or prior booking is required. Also located next to the course is the Matt Stewart Golf Academy, who are responsible for the operational aspects of the course and also offer a driving range facility with an onsite golf professional. Golfers pay a set daily rate for unlimited rounds of golf in one day. Green fees are payable through the Matt Stewart Golf Academy with regular spot checks carried out on the course. All golfers must adhere to the course rules, downloadable below. Club hire is available from the Matt Stewart Golf Academy on payment of a hire charge and a £15.00 deposit, which is refundable, subject to the safe return of equipment. A golf season pass can be purchased which allows unlimited play any time from the course re-opens (March / April) until the golf course closes in the autumn/winter alongside use of the Activity Centre putting green. These offer great value and can be purchased at the Visitor Centre, if 2 passport photographs are provided. The adult season pass price also includes a parking season pass. Members of the Matt Stewart Golf Academy can avail of a discounted rate (subject to conditions) - please ask at Academy for further details. Although the course has no clubhouse, a full range of meals, snacks and refreshments are available from the Coffee Shop or the Snack Stop. Groups can be catered for by prior arrangement.